For the wages of sin is death, but the gift of God is eternal life in Christ Jesus our Lord. Roman. 6, 23. But because of his great love for us, God, who is rich in mercy, made us alive with Christ even when we were dead in transgressions—it is by grace you have been saved. And God raised us up with Christ and seated us with him in the heavenly realms in Christ Jesus, in order that in the coming ages he might show the incomparable riches of his grace, expressed in his kindness to us in Christ Jesus. For it is by grace you have been saved, through faith—and this is not from yourselves, it is the gift of God— not by works, so that no one can boast. For we are God’s handiwork, created in Christ Jesus to do good works, which God prepared in advance for us to do. Ephes. 2, 4-10. So in Christ Jesus you are all children of God through faith, for all of you who were baptized into Christ have clothed yourselves with Christ. Gal. 3, 26-27. I always thank my God for you because of his grace given you in Christ Jesus. For in him you have been enriched in every way — with all kinds of speech and with all knowledge — God thus confirming our testimony about Christ among you. Therefore you do not lack any spiritual gift as you eagerly wait for our Lord Jesus Christ to be revealed. He will also keep you firm to the end, so that you will be blameless on the day of our Lord Jesus Christ. 1. Cor. 1, 4-8. – what kinds of things happened to me in Antioch, Iconium and Lystra, the persecutions I endured. Yet the Lord rescued me from all of them. In fact, everyone who wants to live a godly life in Christ Jesus will be persecuted. 2. Tim. 3, 11-12. 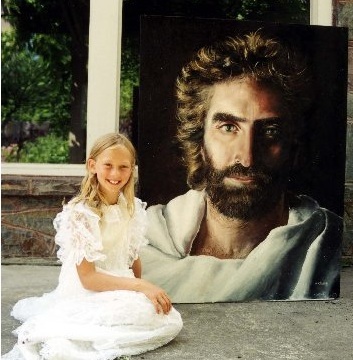 8 year old Akiana Kramarik painted Jesus after a vision. Rejoice always, pray continually, give thanks in all circumstances; for this is God’s will for you in Christ Jesus. 1. Tess 5, 16-18. So from now on we regard no one from a worldly point of view. Though we once regarded Christ in this way, we do so no longer. Therefore, if anyone is in Christ, the new creation has come:The old has gone, the new is here! All this is from God, who reconciled us to himself through Christ and gave us the ministry of reconciliation: that God was reconciling the world to himself in Christ, not counting people’s sins against them. And he has committed to us the message of reconciliation. We are therefore Christ’s ambassadors, as though God were making his appeal through us. We implore you on Christ’s behalf: Be reconciled to God. God made him who had no sin to be sin for us, so that in him we might become the righteousness of God. 2. Cor 5, 16-21. Brothers and sisters, think of what you were when you were called. Not many of you were wise by human standards; not many were influential; not many were of noble birth. But God chose the foolish things of the world to shame the wise; God chose the weak things of the world to shame the strong. God chose the lowly things of this world and the despised things — and the things that are not — to nullify the things that are, so that no one may boast before him. It is because of him that you are in Christ Jesus, who has become for us wisdom from God — that is, our righteousness, holiness and redemption. Therefore, as it is written: “Let the one who boasts boast in the Lord.” 1. Cor. 1, 26-31. See to it, brothers and sisters, that none of you has a sinful, unbelieving heart that turns away from the living God. But encourage one another daily, as long as it is called “Today,” so that none of you may be hardened by sin’s deceitfulness. We have come to share in Christ, if indeed we hold our original conviction firmly to the very end. Hebr. 3, 12-14.